Alex Rodriguez says he will retire after 2017, but can he really walk away? Alex Rodriguez says he will retire when his current contract expires after the 2017 season, but can the Yankees' DH really walk away if he's on the verge of becoming baseball's all-time home run king? Get all of Jay Jaffe’s columns as soon as they’re published. Download the new Sports Illustrated app (iOS or Android) and personalize your experience by following your favorite teams and SI writers. 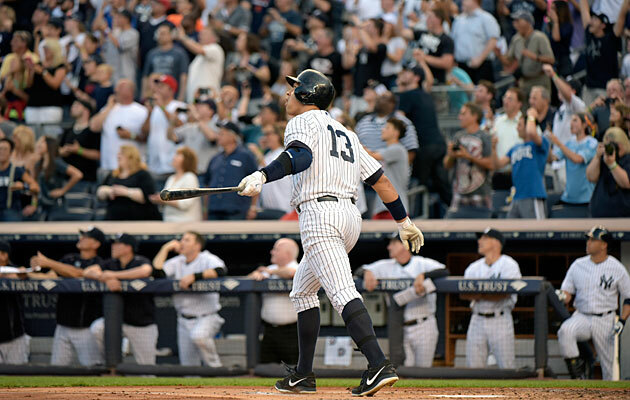 The finish line is in sight for Alex Rodriguez. According to a story by ESPN's Andrew Marchand, the Yankees' 40-year-old slugger says that he'll retire at the end of the 2017 season, when his 10-year, $275 million contract expires. Given his multiple hip surgeries and the rancor with which he fought the league and his team in 2013 during the Biogenesis scandal while unsuccessfully attempting to evade punishment for his use of performance-enhancing drugs, the fact that he can even walk away on his own terms is almost miraculous. Rodriguez was the first player to be suspended for a full season for his use of PEDs, a punishment that had been reduced by arbitrator Frederic Horowitz in January 2014 from an even bigger 214-game suspension handed down by then-commissioner Bud Selig in August 2013. At the time that the Biogenesis story first broke in early 2013, the New York Daily News and USA Today were among the outlets reporting that Rodriguez would never play for the Yankees again despite being owed $61 million for the final three years of his contract. That assertion turned out to be false and even laughable, given its progenitors' attempts to wave away contract law, the Collective Bargaining Agreement and common sense. Nonetheless, Rodriguez's performance in the 44 games he played for the Yankees in '13 after returning from injury (a .771 OPS, his worst since a 48-game season as a 19-year-old in 1995) suggested that both his body and his baseball skills were in an irreversible decline. After a full season away from the game, expectations for what a 39-year-old Rodriguez might provide the Yankees in 2015 were quite low. In fact, New York had re-signed mid-2014 acquisition Chase Headley to a four-year deal to remain its third baseman with that in mind. Rodriguez himself said during spring training, "I'm just trying to make the team." Plans to use him as a backup at both third and first base, a position he had never played before, quickly fell by the wayside, and the Yankees were spoiling for a fight over the contractually-mandated $6 million milestone bonus that he would receive for tying Willie Mays' career total of 660 home runs. Improbably, Rodriguez turned in a strong performance, hitting a team-high 33 home runs, his most since 2008, while batting .250/.356/.486 for a 131 OPS+, his best showing since '09. Though he played just six games in the field—two via late-inning moves from DH—his 151 games played was his highest total since 2007. ​Along the way, Rodriguez worked his way back into the good graces of the team as well as the game's fans, not only in New York but elsewhere, by summoning heretofore-unknown reserves of remorse, humility, candor and self-deprecating humor. The reception was hardly unanimous, but once he showed that he could be productive amid a lineup that was dotted with question marks, the Yankees brass and their fans had little choice but to embrace his presence and hope that he could continue to hit. As the milestones mounted, so did the volume of cheers—at least outside of Boston, where on May 1, he was greeted with boos and then stunned silence upon tying Mays with his 660th homer. Wisely, he chose to avoid a public battle over the bonus and kept the focus on his surprising rebound. On June 19, Rodriguez collected his 3,000th career hit with home run number 667. Professional ball hawk Zack Hample, who caught the homer, initially refused to negotiate for its return and vowed to add it to his collection of over 8,000 other balls, but two weeks later the team struck an agreement for the ball via a charitable donation of $150,000 to Pitch in for Baseball, an organization that Hample has supported. At the same time, Rodriguez and the Yankees amicably resolved the milestone bonus by jointly donating a total of $3.5 million to multiple charities. After clubbing nine homers in July, his best month of the season, Rodriguez endured a deep slump in August, and he never fully regained his early-season form; he hit .278/.382/.515 in the first half, compared to .216/.324/.448 in the second. Still, he helped New York to its first postseason appearance since 2012, though the Yankees lost to the Astros in the AL wild-card game with A-Rod going 0-for-4 with two strikeouts. While he lost out on AL Comeback Player of the Year honors to the Rangers' Prince Fielder, Rodriguez made a positive impression as a studio analyst for Fox during the postseason, hinting at a possible career on television after his playing days are done. At the outset of this year's spring training, he called 2015 "in many ways a Cinderella season." Indeed, it was a fairy tale, more like the Comeback of the Century than merely comeback of the year. "I get treated better today than before my screw-ups," Rodriguez told Marchand on Wednesday. "That is hard to believe and it is hard to comprehend sometimes, but I'm grateful for it." While Rodriguez said he would not play after next season, it's worth wondering if he will revisit that thought should he find himself within striking distance of Barry Bonds' all-time home run record. Currently, he's at 687, 27 short of Babe Ruth's total of 714, which ranks third on the career leaderboard. That's attainable this year, if Rodriguez turns in a performance similar to what he did in 2015, though as he enters his age-41 season, such a showing is anything but a given. He's 68 homers away from tying Hank Aaron for the number two ranking at 755, and 75 away from tying Bonds, who hit 762. To reach Aaron's mark, Rodriguez would need to average 34 homers a year for two seasons. He hasn't done that since 2007 and '08, when he hit 54 homers and claimed his third AL MVP award in the former year and followed it up with 35 home runs in the latter season, a year in which he turned 33 years old. If Rodriguez is nowhere near 755 or 762 at the end of 2017, retirement would be a no-brainer, but if he is close—say 10 or 15 away—the temptation for him to stay would be greater. Chasing the record would inevitably place him in the glare of the spotlight, albeit not to the extent that Aaron endured when he pursued Ruth, a chase accompanied by racist hate mail and death threats. Nor would it compare to Bonds' joyless pursuit of Aaron, given that the Giants' outfielder did so while under investigation by a federal grand jury regarding his BALCO testimony; Bonds was indicted on charges of perjury and obstruction of justice in November 2007, four months after claiming the record, and never played again. While many fans and analysts view Bonds and Rodriguez as two of baseball's greatest villains for their PED ties and would just as soon neither held the all-time record, the two sluggers would differ in this context: At the tail end of his career, Bonds was unrepentant, though he almost had to be, given the ongoing legal activity that surrounded him. It took until 2011, eight years after the BALCO story broke, before Bonds was convicted of one count of obstruction of justice, though the conviction was overturned last April. Rodriguez, on the other hand, served his suspension, acknowledged his mistakes and worked hard to rehabilitate his image, taking advantage of the platform that still being an active player afforded him. Having fallen and risen again as a wiser and more humble man, he might carry some amount of populist appeal as the potential home run king, even if some will never forgive his mistakes—likely including Hall of Fame voters, who have thus far refused to elect Bonds. On the other hand, Rodriguez could make a powerful statement by walking away even if he's close to the record, not only by choosing the pull of family instead of another multi-million dollar payday but by saying, in essence, "I'm satisfied now, I don't need to be number one." That might seem improbable given the hard-wiring of most competitive athletes, but at this point, A-Rod’s capacity for improbability is already atop that particular leaderboard.